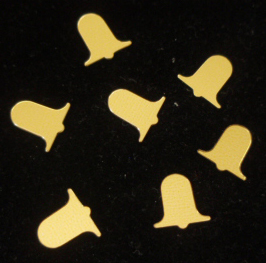 Wedding bells in gold to decorate for a wedding. 1/2 oz bag. Price is for one bag. If used to sprinkle around centerpieces, one bag does 2 1/2 tables. Color matches to the gold doves confetti. Regular price $2. 7 bags available.